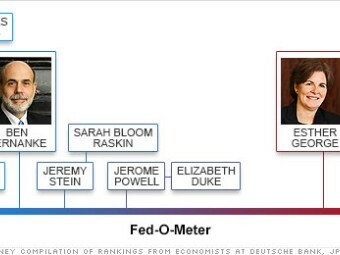 The Federal Reserve's 2013 roster seems to favor the doves over hawks. The Federal Reserve will shake up its roster at its meeting this week, just as it does at the beginning of every year. Four regional presidents are rotating into voting roles on the FOMC (short for Federal Open Market Committee). This year's rotation brings two doves and two hawks to the table. In the current environment, the hawks are those who sound the loudest warnings that stimulative policies now could fuel rapid inflation later. Doves, on the other hand, tend to argue that inflation is not a major risk any time soon. They would prefer the Fed focus on stimulating the economy and aiding the job market. Economists from Deutsche Bank, JPMorgan Chase and Nomura ranked the Fed's 12 voting members based on whether they're doves or hawks. We took an average of their rankings to create the chart above. It seems the balance of power is favoring the doves, now that staunch inflation hawks like Charles Plosser, Jeffrey Lacker or Richard Fisher no longer have votes. Click through the slideshow to read about the four newest voting members.